Hate Raising Your Hand for Too Long? March 24, 2012 - SORTED IN What in the World Is Going On? This is Mahant Amar Bharti Ji. In 1973, to show how strong he felt about his religious beliefs, he raised his hand. 38 years later and it’s still up. Because of this, Mr. Mahant Amar Bharti Ji no longer works or can do the everyday things that you and I can do. Also, because his arm and hand has been in that same position for this long, he can’t move them anymore. This may seem odd, but similar self sacrificing things are done all the time for religious beliefs. Below is a close up of the damage done to Mr. Amar Bharti Ji’s hand. scoop tip: self sacrificing means to give up the things that you need or want for yourself to please someone else , a cause, or faith that you belief in. 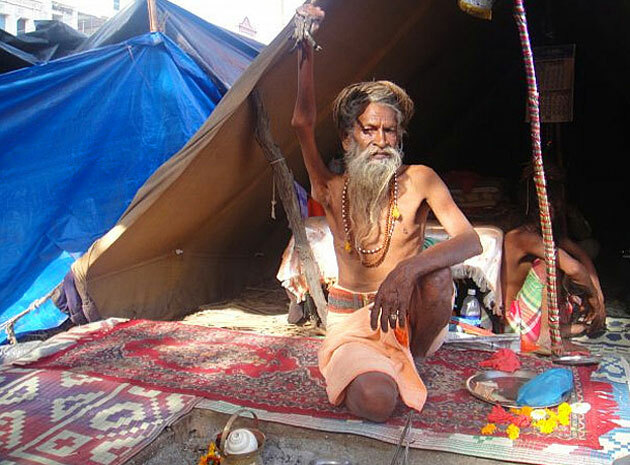 In the Hindu religion, people have also did things such has no longer talking for the rest of their lives or even starving themselves to death.